Whether it's a post, a tree, or your favorite sofa, every cat is going to scratch something. They have a physical need to scratch. It helps them to shed the outer sheaths of their nails while also acting as a territorial marker. There are lots of choices for good scratchers out there and some cats respond more to some than to others. Your best bet is to try several types until you find the one your felines like best. Today, we're looking at a horizontal scratcher made from corrugated cardboard. This one, made by Love My Cat, has a few design features that distinguish it from the crowd. First off, it's inexpensive. As of this writing, the scratcher is selling for $12.95 on Amazon. That's much less than some comparable scratchers. The best plus, and one we haven't seen on other scratchers of this type, is the convoluted surface. This actually helps cats gain purchase with their claws when using this scratcher, making it very appealing to most of our test kitties. In addition, the scratcher can be flipped over, offering a flat surface if your cat prefers that, or if the convoluted surface wears out. Yes, this type of scratcher will eventually wear out. The cardboard rips a little with each use and some cats can produce a pile of debris in very little time. This isn't due to any problem with the scratcher. Instead, it just shows how appealing it can be to felines who like to get a good horizontal stretch when sharpening their claws. In the odd responses department, we must add that one of our cats is intrigued by the feline silhouette on the side panel of the scratcher. But that hasn't stopped her from using the surface for its intended purpose. 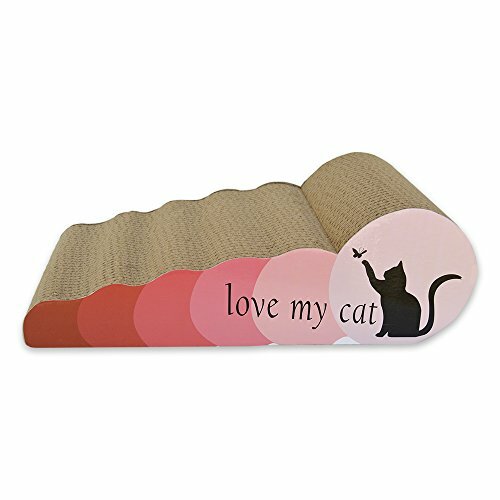 We highly recommend the Love My Cat scratcher. Happy scratching!